In the dark days that followed the massacre at Sandy Hook, one phrase spoke to the sliver of hope and optimism a grieving state was desperately hanging onto: Love Wins. 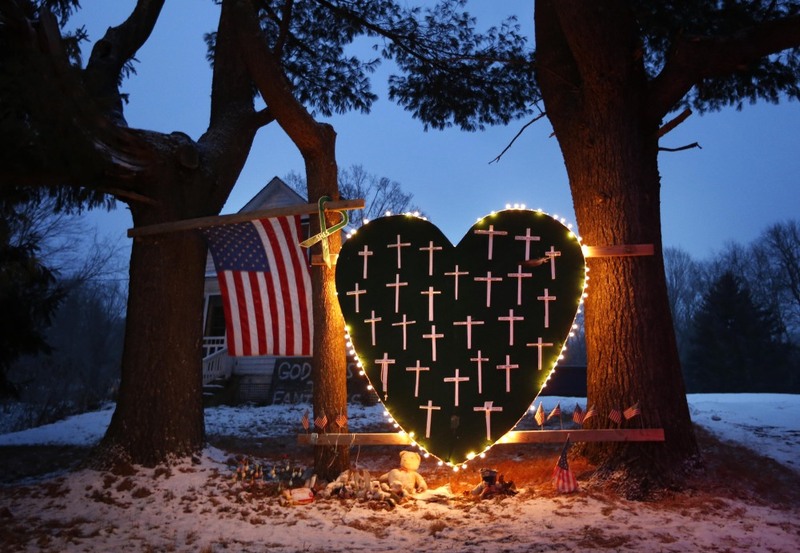 A makeshift memorial with crosses for the victims of the Sandy Hook massacre stands outside a home in Newtown, Conn., Saturday, Dec. 14, 2013, the one-year anniversary of the shootings. If the horror of Sandy Hook was unthinkable, the depravity that followed was unimaginable. Conspiracy theorists concocted garbage fictions to drive paranoid agendas or simply grab attention. They attacked grieving parents, public officials and journalists. Those who sought to eradicate the weapons of mass destruction that make killing far too easy were vilified as un-American, as if patriotism was defined by how loudly one could chant “USA” while waving an AR-15 around. Here, in Newtown, Jeremy Richman — who not only had to endure the death of his beloved daughter, Avielle, at Sandy Hook but the inanity of those who suggested her death had been staged — took his own life. It’s between those willing to listen and learn the truth of things and those who want to manipulate facts to serve their own agendas. It’s between those who still believe in the promise of one indivisible nation and those who are trying to weaponize hate and division.